Repair and replenish all in one, with Goat’s Milk and Honey Moisturizing Lotion. Scientifically formulated for uneven skin tones and textures. Helps to gradually fade away dark spots and scars on the body. Rich in moisture and hydration, without leaving a greasy feel. Organic Coconut Oil, Aloe, and Honey to hydrate severely dry skin, leaving a supple look without a greasy feel. 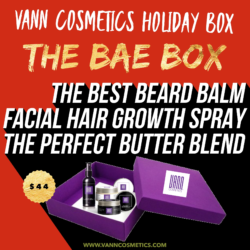 Vann Cosmetics is a high-end luxury beauty line. Vann Cosmetics creates natural haircare & skincare products formulated by expert black and brown cosmetic chemists, who accurately solve your needs.